High-level defense officials met in Beijing to establish a hotline and discuss Japan’s collective self-defense. China and South Korea held their fourth Defense Strategic Dialogue this Wednesday in Beijing. The Chinese delegation was led by Wang Guanzhong, the deputy chief of general staff of the People’s Liberation Army (PLA), and the Korean delegation was led by Baek Seung-joo, deputy defense minister of the Republic of Korea (ROK). Baek additionally met with the Chinese defense minister ahead of the dialogue. The two sides discussed North Korea, particularly the country’s worrying missile and nuclear programs, and also considered setting up a defense hotline between the two defense ministers. The Defense Strategic Dialogue follows Chinese President Xi Jinping’s much publicized visit to South Korea just a few weeks ago. According to Yonhap, Baek expressed “concerns” over Japan’s recent decision to reinterpret its constitution allowing for its military to participate in collective self-defense–an act that was previously banned under Article 9 of Japan’s post-war pacifist constitution. 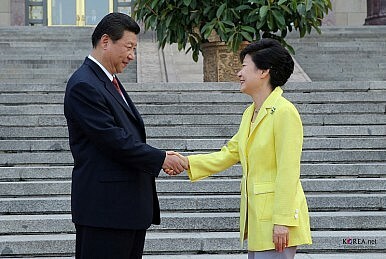 According to a statement from the Chinese Defense Ministry, Baek “expressed concerns over the Japanese government’s insistence on the wrong and backward conception of history and its massive amendment of the defense policy.” Relations between Japan and South Korea have been strained during Japanese Prime Minister Shinzo Abe’s term which began in December 2012. Abe, a conservative nationalist, has raised concerns in South Korea and especially in China due to his nationalistic posturing. His cabinet’s decision to approve a resolution reinterpreting Japan’s pacifist constitution has led to concerns that modern Japan may emulate the militarism of Imperial Japan in the 1930s. Baek also emphasized his interest in cooperating with China on regional security. There were scant details about what exactly this would entail. South Korea remains squarely in the United States’ sphere of influence as a pivotal ally in Northeast Asia. The United States maintains a considerable permanent troop presence in the country and would even maintain operational control of ROK troops during a hypothetical conflict with North Korea. It is likely that South Korea and China may cooperate to ensure that Japan under Shinzo Abe remains under check militarily. In addition to sharing their views on Japan, the two delegations signed a memorandum of understanding that will see a direct telephone line established between their two defense ministers. Kim Min-seok, the spokesperson for the Korean Ministry of Defense, notes that the high-level military hotline “will play a role as a communication channel to invigorate the military cooperation of each country and assure security in the Northeast Asia region.” The hotline is primarily intended to allow for speedy high-level communication between Beijing and Seoul on North Korea. The hotline could prove crucial during any significant military altercation involving North Korea. Seoul currently only has a direct high-level military hotline with Washington. More Than Meets the Eye: The 2018 Japan-China-South Korea Trilateral SummitChina Hits Back at South Korea's THAAD Deployment Following North Korea's Latest ICBM TestUS Starts Deploying THAAD Anti-Missile Defense System in South KoreaUS, Japan, South Korea Plan Missile Defense Exercise on RIMPAC 2016 SidelinesWhat Is THAAD, What Does It Do, and Why Is China Mad About It?